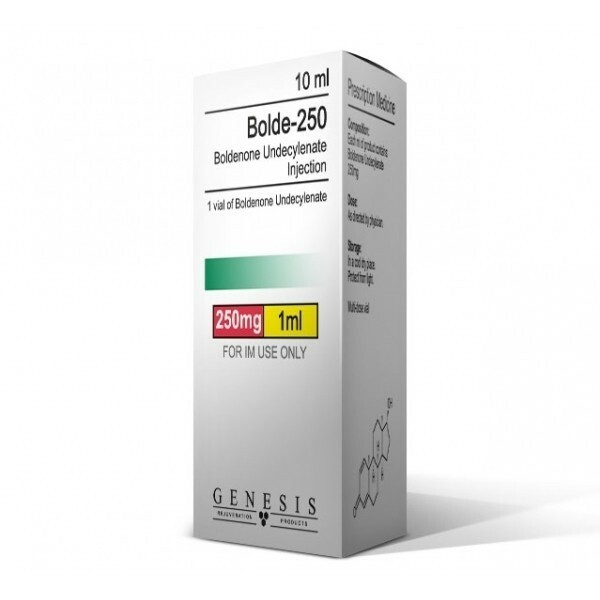 Bolde 250 is the common brand name for the active anabolic steroid ingredient Boldenone Undecylenate. Boldenone is a very popular steroid. Boldenone is only available legally at a veterinarian clinic. Boldenone is a highly anabolic, moderately androgenic steroid. For this very reason, Boldenone is typically taken in a stack with other steroids like Testosterone if you are on a mass cycle or perhaps with Winstrol if you are on a cutting cycle. The main benefit of taking Boldenone (Equipoise) is that Boldenone increases protein synthesis in the muscle cells. This effect of Boldenone is very similar to what you would experience while taking Anavar. Boldenone gives you slower but much more high quality gains in muscle as opposed to the normal "quick" muscle gains that you would expect from a testosterone. Boldenone is not a rapid mass builder, instead it provides a slow but steady gain of strength and quality of muscle mass. The most positive effects of Boldenone are seen when it is used for longer cycles, usually lasting more than 8-10 weeks in duration. You can expect around 3 weeks before you start seeing results and they are not going to be staggering, but will be "more permanent" than any gains you would get from any of the multiple testosterones that are available. Boldenone stays active in the system longer than most of the testosterones as well. This makes Boldenone a poor choice if you run the possibility of being drug tested. Boldenone is very common in the precontest arena for two main reasons. First off, there is a low amount of aromitization and secondly there is very little water retention while taking Boldenone (Equipoise). This makes Boldenone (Equipoise) a good precontest steroid. Boldenone is well known to give a good increase in the pumps you get while working out. This is caused from the increase in red blood cells that you will experience while taking Boldenone. It is also well known to help cause a dramatic increase in appetite. Boldenone (Equipoise) is a very versatile compound. We can create a number of drug combinations with it depending on the desired result. For mass (bulking cycle), one may want to stack it with Anadrol or Sustanon (any injectable testosterone). The result should be an incredible gain of muscle size and strength, without the same intensity of side effects if using the androgen (at a higher dose) alone. When used in a cutting cycle, muscle hardness and density can be greatly improved when combining Boldenone (Equipoise) with a non-aromatizable steroid such as Trenbolone Acetate or Winstrol. For some however, even the low buildup of estrogen associated with Boldenone is enough to relegate its use to bulking cycles only.